Set on a lush Smoky Mountain hillside with beautiful mountain views is A Wildflower Retreat. In winter, enjoy stunning views of the rolling Smokies beyond, and in spring and summer, you’ll be surrounded by the natural beauty of green trees and vibrant wildflowers. 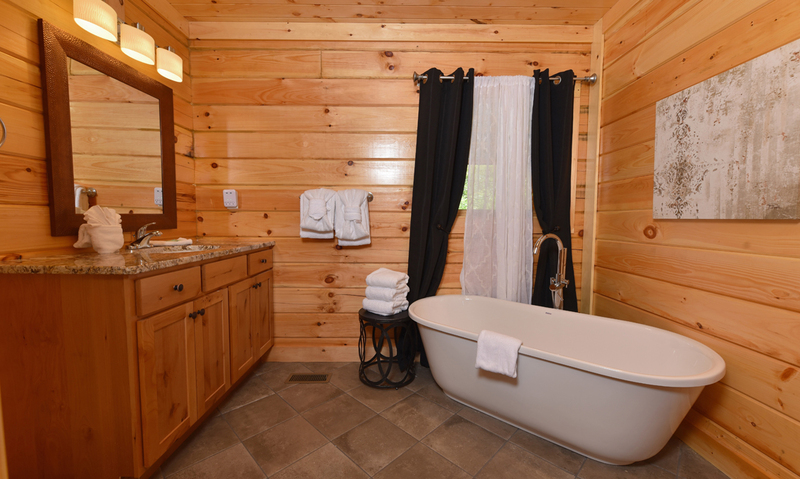 Every season is special at this 1-bedroom, 1.5-bathroom cabin with 1,200 square feet of space, enough to comfortably accommodate up to 8 guests. Plan for a Gatlinburg getaway with the family, an 8-person retreat with friends, or a romantic trip for 2. 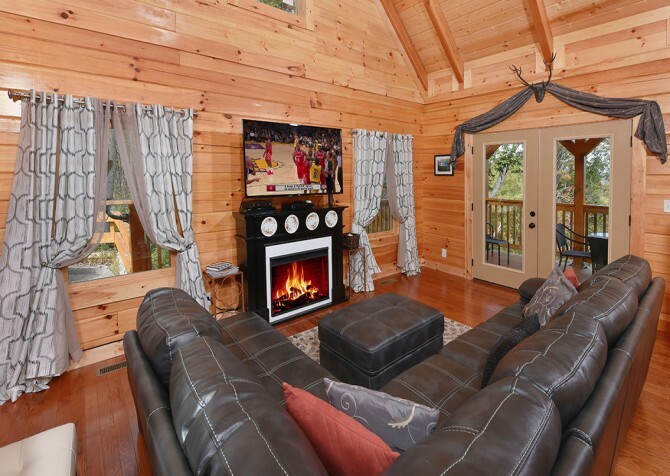 This cabin’s clean, modern interior has everything you need to make your Gatlinburg vacation comfortable and full of fun, including cozy living spaces, a fully equipped kitchen, a pool table, an outdoor hot tub, and an electric fireplace. This charming abode is also pet friendly, meaning you can enjoy the mountains with your entire family this year! 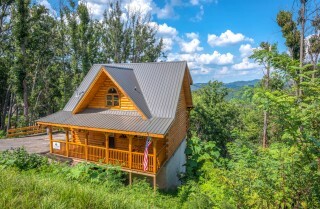 Bring along your family, friends, and furry companions to this newly built Gatlinburg cabin and get ready for an unforgettable time in the Smokies at A Wildflower Retreat. 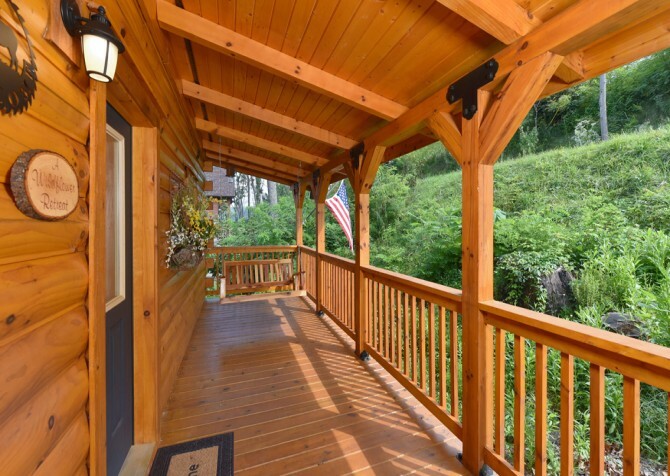 When you step into A Wildflower Retreat, you’ll be stepping into your home away from home here in the Smokies. This pet-friendly cabin features a comfortable living space where you and your guests are free to relax and make the most of your Gatlinburg vacation. 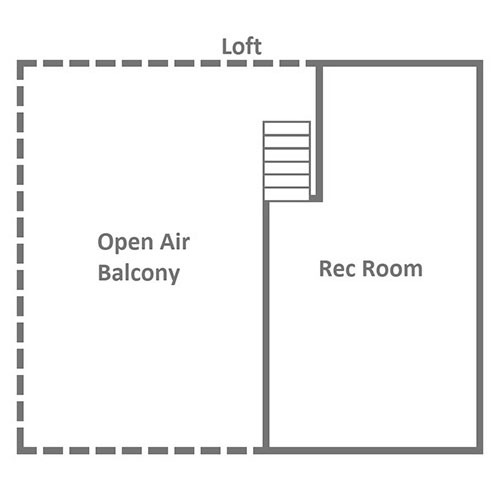 Kick back on the L-shaped sectional (doubles as a sleeper sofa for 2) and prop your feet up on the matching ottoman. 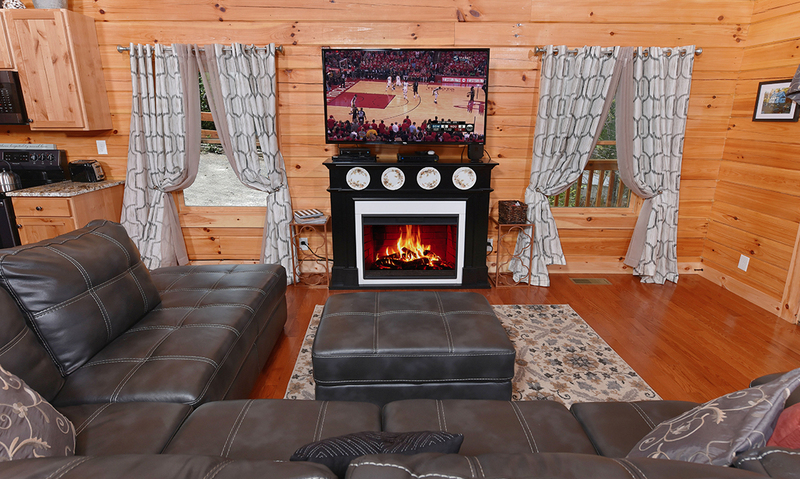 Enjoy a favorite book, a conversation with friends, or a new Blu-ray movie or DVD series on the 55-inch big screen TV — offering DIRECTV for YOU! Another special feature of this cabin’s living room is the contemporary electric (heated) fireplace, which pairs perfectly with the hardwood flooring and decorative area rug. This is the perfect place for your group to gather around, enjoying the warm fire on those chilly mountain evenings. 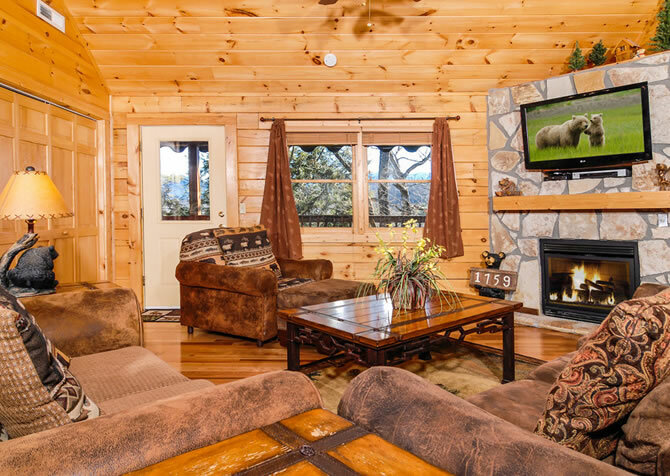 Make some hot cocoa and a fresh batch of party mix and get ready for fun times with friends and family in the open and inviting living room of A Wildflower Retreat. A Wildflower Retreat’s kitchen is conveniently located to the left as you enter the front door, making unloading the groceries for homemade meals and midnight snacks a breeze. 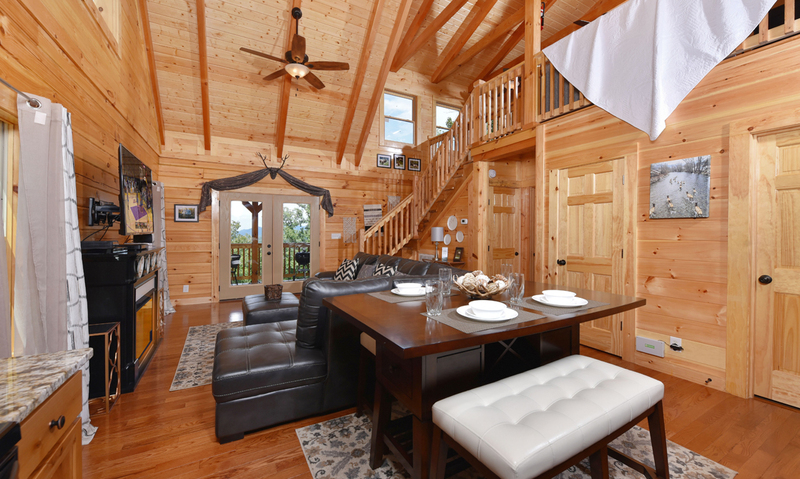 The open-concept design leaves the kitchen open to the living room and dining room as well as to the natural light flooding in from the large windows throughout this Gatlinburg cabin. Gorgeous granite countertops, warm wooden cabinetry, and stainless-steel appliances create a meal-prep space where you’ll actually look forward to cooking! 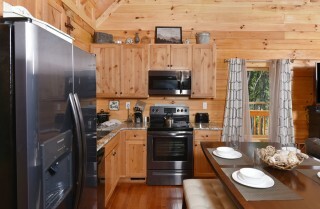 Upgraded appliances include a built-in microwave, electric stove, oven, refrigerator with ice maker, and dishwasher. 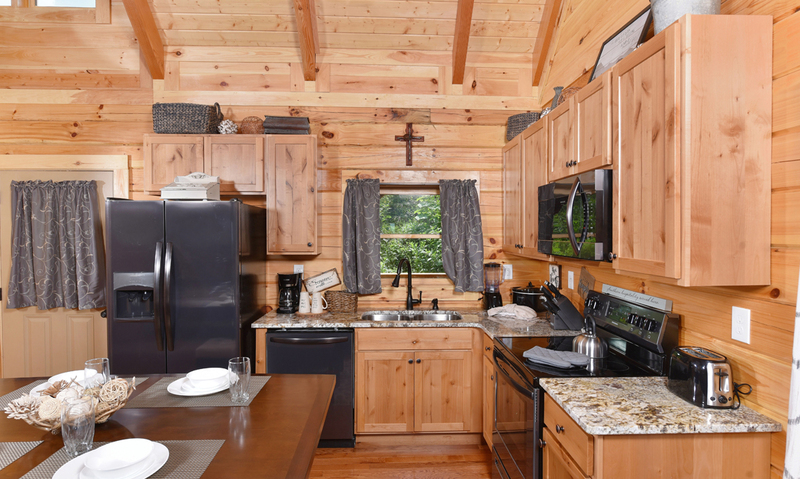 You’ll also have access to a coffeemaker, crockpot, knife set, toaster, blender, cooking utensils, pots and pans, dishware, cutlery, and wine glasses. 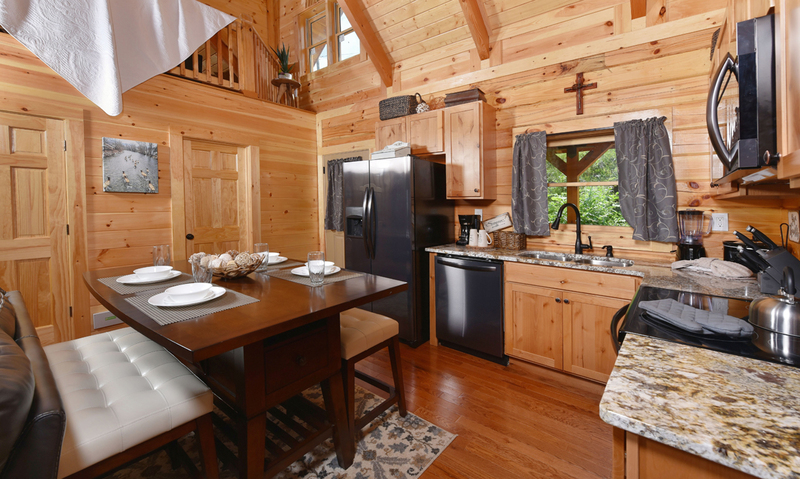 This cabin has everything you need for yummy homemade meals during your Gatlinburg stay, which is a great way to enjoy time together and save money! 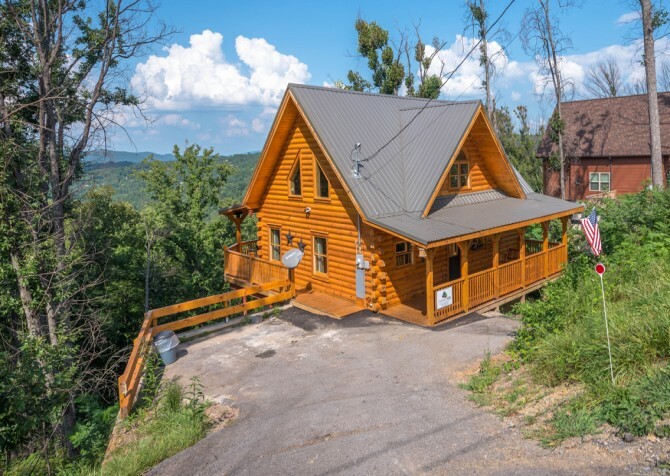 However, a trip all the way to the Smoky Mountains isn’t complete without trying some of the delicious restaurants downtown. Check out our Gatlinburg Restaurant Directory to read more about what’s in the area and enjoy some Southern food done right while you’re in the Smokies! The dining area of A Wildflower Retreat features a lovely wooden table with elegant cushioned benches. 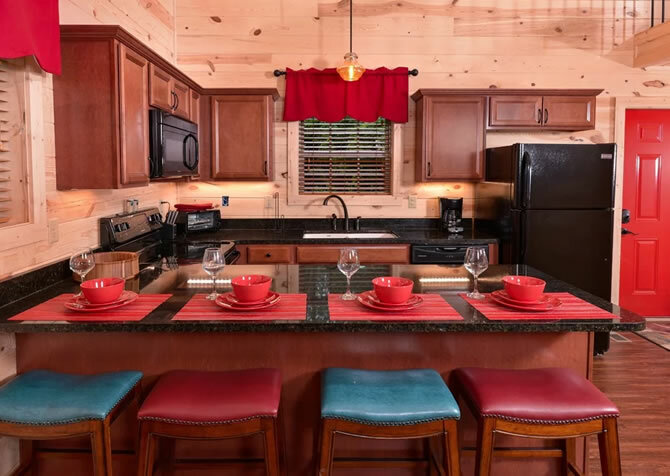 This cozy space is open to the kitchen and the living room, allowing for easy access to refill your plates and extra seating for additional guests. The dining table is large enough to enjoy intimate meals with friends and family during your stay. It can also double as a card table or game table for Monopoly night with the kids or Bridge night with the ladies. The great thing about dining inside your Gatlinburg cabin is you’ll have the privacy of eating together, and you’ll have the beautiful views of the Smoky Mountains right outside the French doors across the way. What better backdrop for a delicious meal with your family could you ask for? 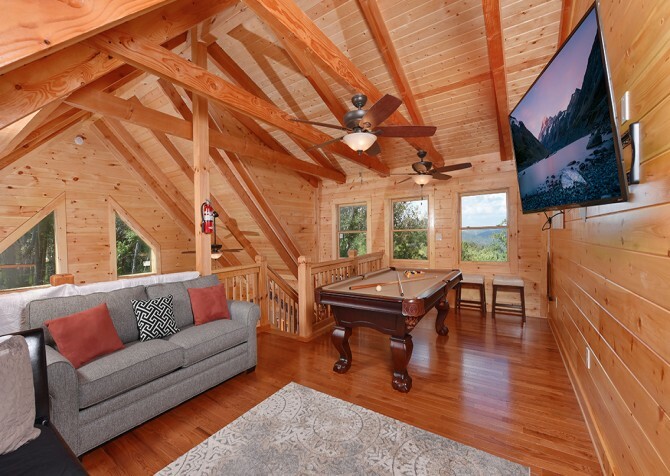 Whether you’re traveling with the kids, your significant other, or a small group of friends, the loft at A Wildflower Retreat is sure to become a favorite hangout space during your Gatlinburg getaway. 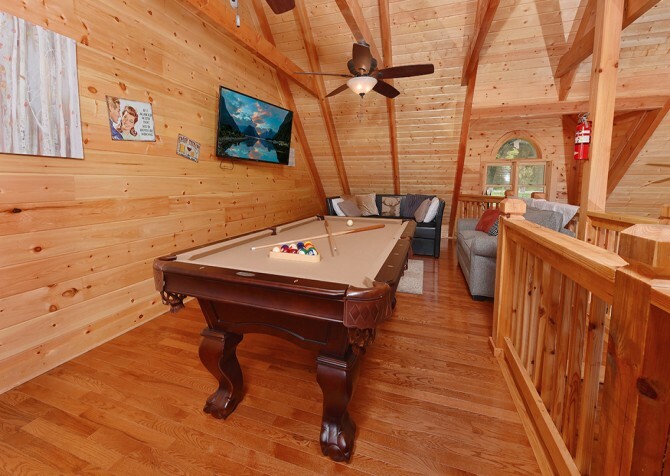 This space features a full-size pool table and another 55-inch big screen TV! 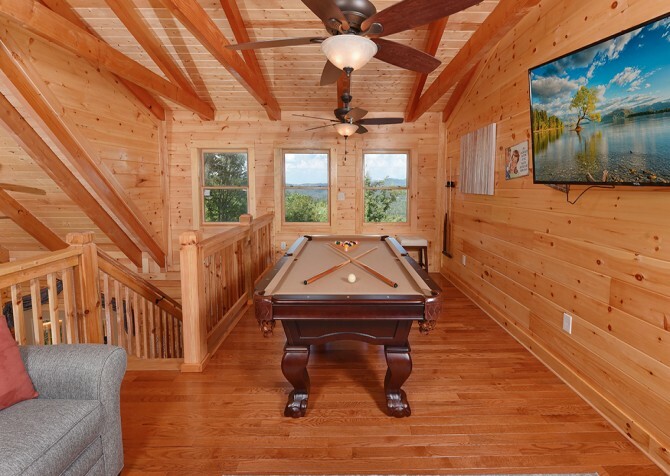 And there are even 2 ceiling fans to keep players extra cool during heated battles. 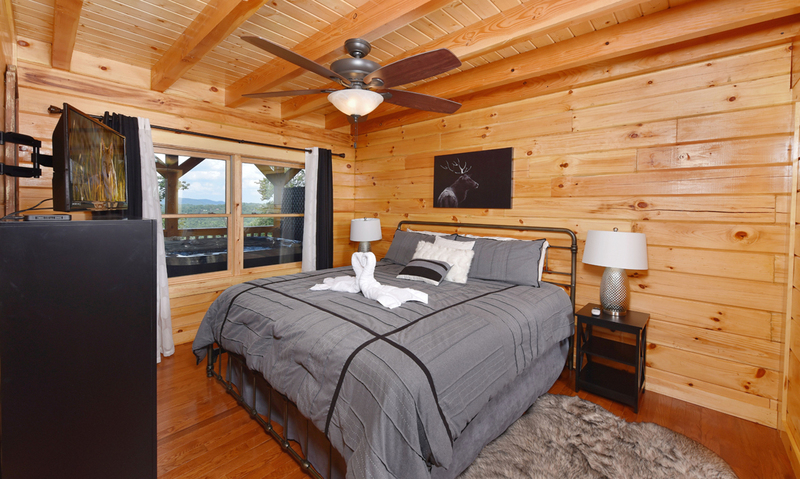 After a few friendly rounds, grab a few pillows, plop on the plush sofa and trundle bed, then watch a comedy show or action flick with friends. 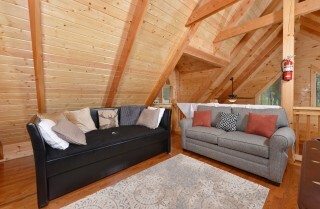 This space even has a soft area rug where the kids can spread a sleeping bag or some blankets and watch a movie together. During the day, simply relax with beautiful mountain views streaming through the windows along the back wall. It can also function as a guys’ getaway while the girls go shopping at The Village. 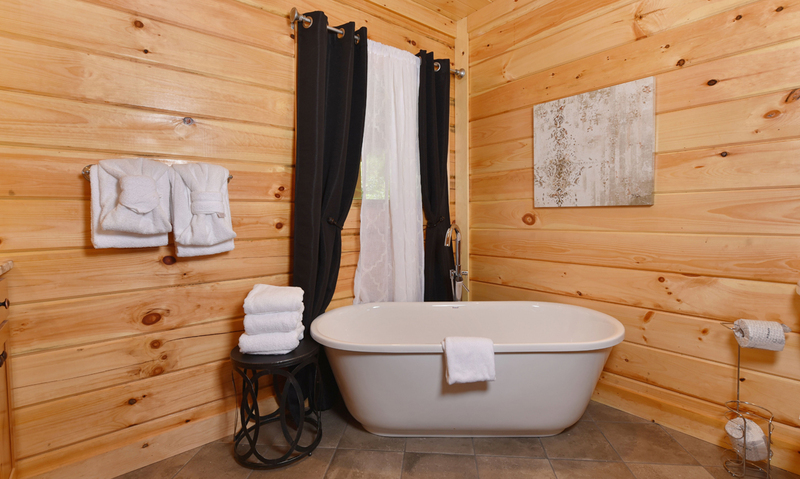 However you use it, you’re sure to love the loft in A Wildflower Retreat! The master suite of A Wildflower Retreat provides the perfect place for parents, honeymooners, or couples looking for a relaxing getaway to catch some R&R during their Gatlinburg vacation. 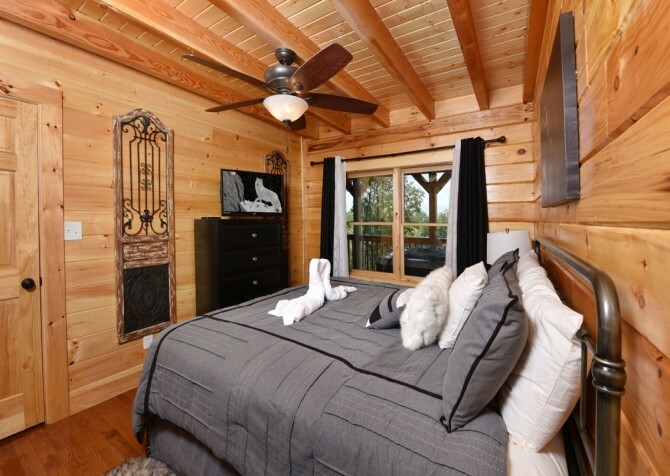 This bedroom features modern furniture and stylish décor, including a king-size bed, 2 nightstands, a bureau, 2 large windows with drapes, and a mounted 32-inch flatscreen TV. And you’ll be happy to find a garden tub for rejuvenating soaks in the en-suite bathroom. 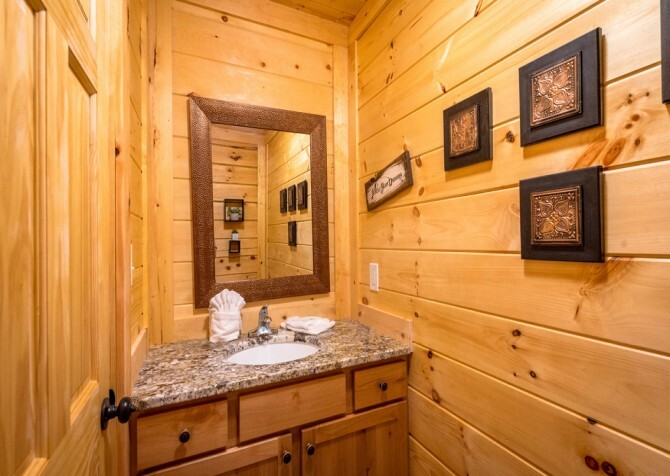 For optimal convenience, there’s even a half bathroom in the home. A Wildflower Retreat also comes with a sleeper sofa in the living room and a daybed with trundle plus a sleeper sofa in the loft, where kids and other guests are welcome to stay. Total, you’ll have room for 8 in this Gatlinburg cabin. 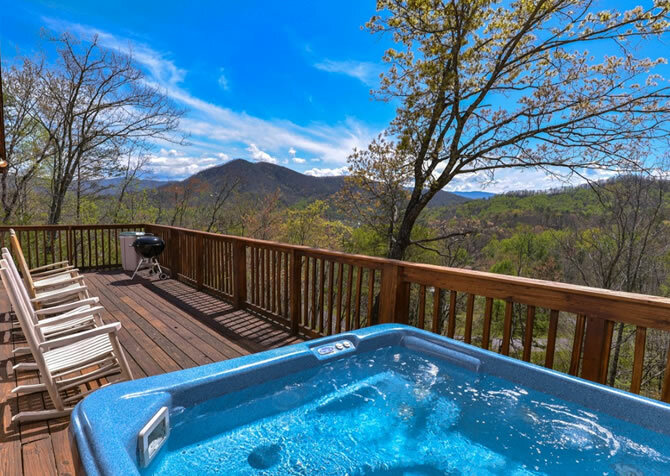 A trip to the Great Smoky Mountains just isn’t complete without enjoying amazing mountain views. 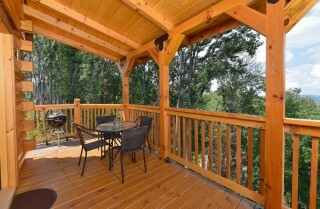 At A Wildflower Retreat, you’ll have close access to these handsome views right from your back porch! 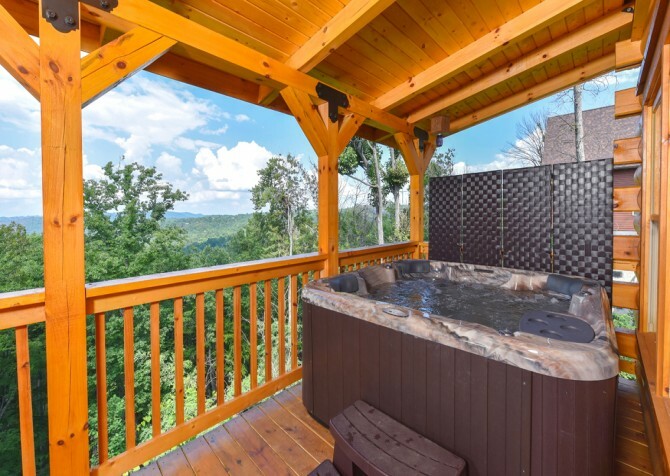 No matter the season, this cabin offers beautiful views of Smoky Mountain scenery, which you’ll be able to enjoy from the outdoor seating area, outdoor dining table for 4, or the 7-person outdoor hot tub! 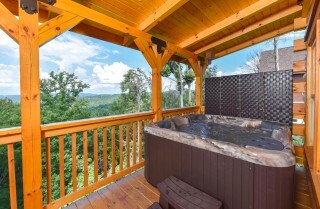 The hot tub also comes with a privacy screen for those looking for some intimacy during your Gatlinburg stay. 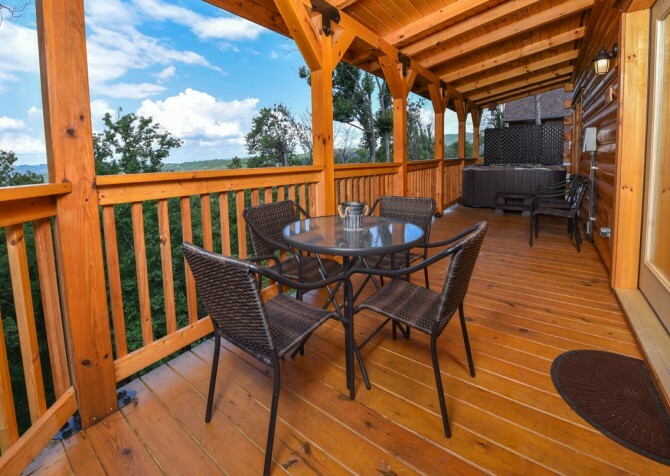 And the outdoor dining table is located right next to a Webber charcoal grill, where you and your family are invited to make your own barbecue favorites without having to leave the comfort of your cabin. There’s even a porch swing out front, perfect for enjoying rainy afternoons with a cup of tea as you listen to the soothing raindrops dance on the metal rooftop. For more ideas on how to enjoy the great outdoors while you’re in Gatlinburg, check out our article on Outdoor Activities. 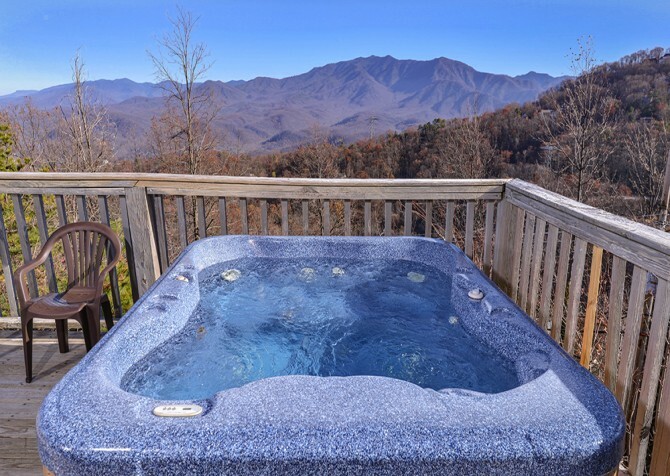 From horseback riding to Hummer off-roading, you’re sure to find something fun to do outdoors in the Smokies! Then return to your semi-private home in the mountains via flat, paved roads that lead to a steep, paved driveway with parking for 2 at the top. The best part is you can easily unpack the cars with 0 steps into the cabin. A Wildflower Retreat is more than a place to stay — it’s a place to call home while you’re in the Smokies. 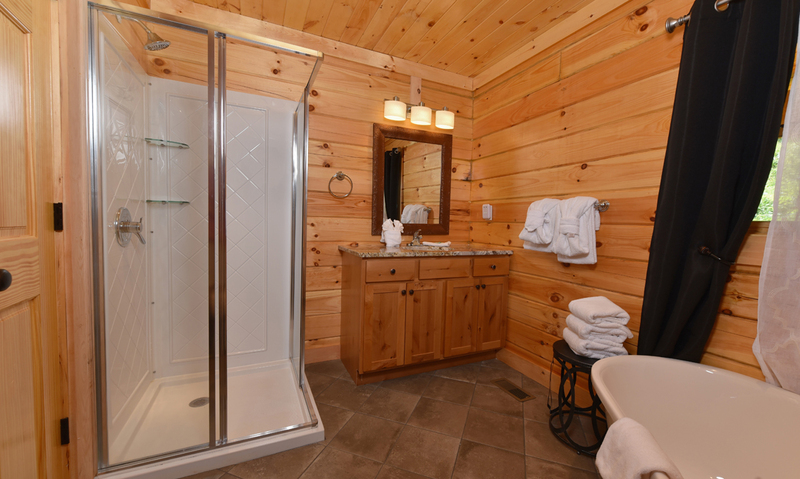 That’s why we’ve made sure to provide you with amenities like a washer and dryer and complimentary high-speed Wi-Fi during your stay. 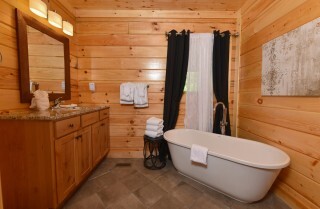 And, of course, don’t forget that this cabin features other special extras like a TV in the bedroom, an electric fireplace, and a charcoal grill. 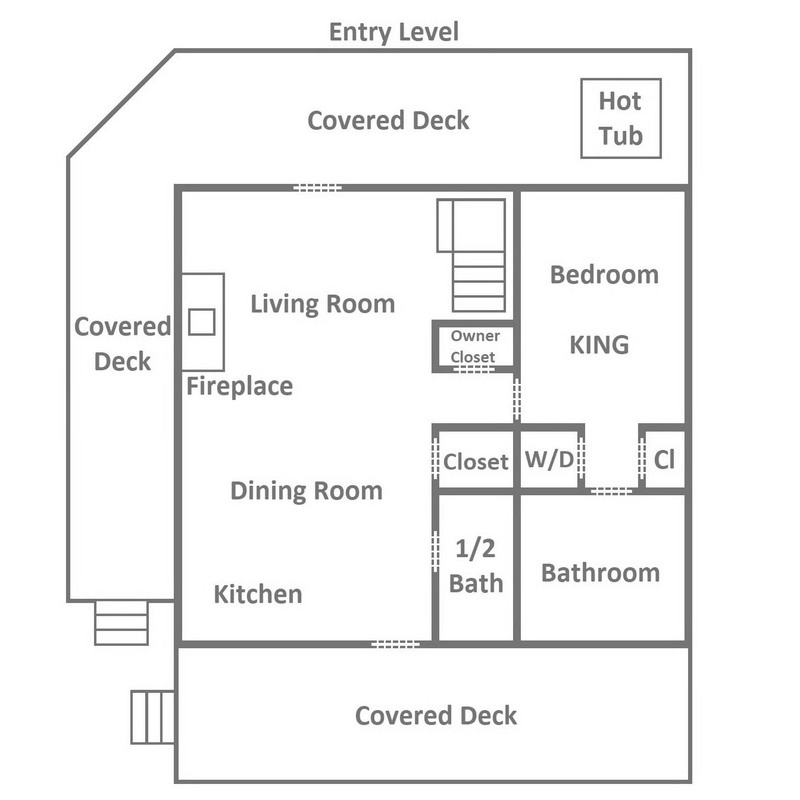 And did we mention it’s pet friendly?! 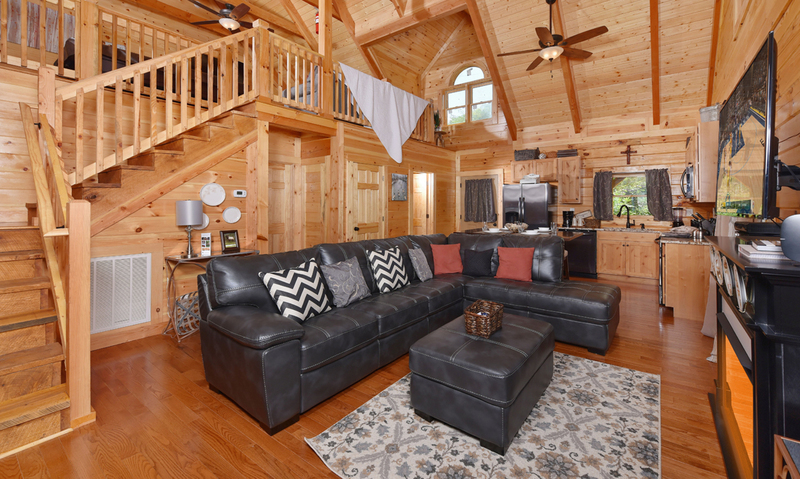 A Wildflower Retreat really is a versatile Gatlinburg cabin where families, friends, and couples are guaranteed to enjoy their stay and have a great time — with Fido, too! See the sites of the Smokies at your own speed on the Gatlinburg Mountain Coaster! 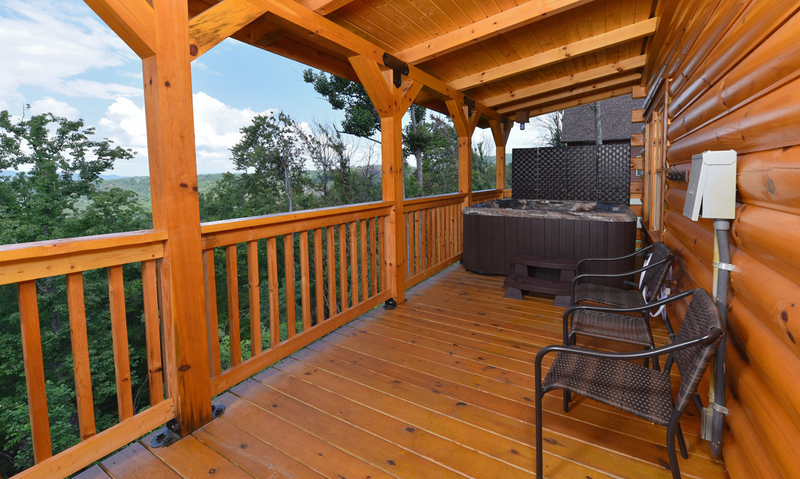 This ride is open year-round — rain, snow, or shine — and requires no special skills to operate. On a rainy day, the perfect place to escape in the Smokies is Ripley’s Aquarium! With special events for kids and tons of main-stay attractions, it’s no wonder this aquarium is ranked one of the top aquariums in the U.S. by the Travel Channel! Take your family or a group of friends for hours of excitement at Gatlin’s! This attraction features laser tag, bumper cars, indoor miniature golf, and so much more! 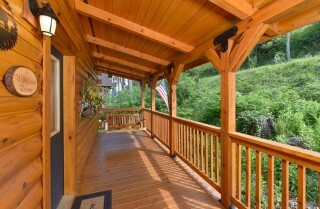 "The driveway was hard to get out of, very steep. Overall, it was wonderful." We're so glad you enjoyed your stay at A Wildflower Retreat! While the driveway is steep and paved, thankfully the top flattens out so you can unpack the cars with ease. We look forward to your next visit!